Trade between India and Pakistan is expected to rise substantially from its present $2.7bn a year following the opening of a new checkpost at the Wagah border crossing, analysts say. The terminal has immigration facilities to ease the movement of traders and lorries carrying goods over the border. The area will be closely monitored by multiple close-circuit cameras. Businessmen of both countries have long complained of difficulties in accessing each other's markets. 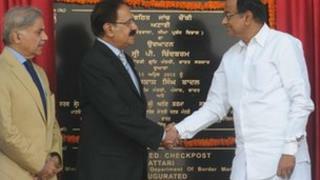 Several top Indian and Pakistani ministers were present during the formal inauguration of the facility. On Thursday, 25 Indian fishermen were released from a prison in Pakistan "as a goodwill gesture". The men had been held on charges of violating Pakistan's maritime boundary. Their release comes as the nuclear-armed rivals move to boost trade ties ahead of resolving complex political issues such as the disputed Kashmir region. The newly-inaugurated checkpost at the Wagah border will have modern facilities with dedicated terminals for cargo. Speaking at a Delhi news conference before the opening, Indian Commerce Minister Anand Sharma said India would soon be open to direct foreign investment from Pakistan. Pakistan has decided to liberalise trade with India and recently announced it would phase out restrictions on most imports which are currently banned. The first meeting in India of Prime Minister Manmohan Singh and Pakistani President Asif Ali Zardari on Sunday raised hopes that the peace process - set back by the 2008 Mumbai attacks - could be revitalised. The move to release prisoners and the inauguration of the trade facility are seen as steps to release tension on both sides. On Wednesday India's Supreme Court granted bail to a Pakistani man, Dr Khalil Chishti, who had been found guilty of a 1992 murder in India. Another prisoner, Samant Lakshman Bambhaniya, who suffers from bone cancer and has been released from a Karachi prison, is expected to fly back to India on Saturday, reports say. Eight more prisoners from other Pakistani jails will reportedly be released on Saturday. Hundreds of fishermen are arrested each year by both governments, but the resumption of the peace process between the two countries after the 2008 Mumbai attacks has raised hopes they can be more quickly released. The Press Trust of India (PTI) news agency quoted Karachi's prison superintendent Nazeer Husain Shah as saying that another 423 Indian fishermen are still being held. Meanwhile, more than 150 Pakistani fishermen are in Indian prisons, PTI quoted Pakistani officials as saying.